Unless you’ve been sleeping on your porch in alternate reality 1985, you will have noticed that yesterday, Wednesday 21st October 2015 was #futureday. The date in which Marty McFly travelled forwards in time to in the second Back to the Future movie. Well on Saturday 17th October 2015, me and co-conspirators in hackday mischief Jon and Adam played host to Hack to the Future. Now that’s all in the past (boom boom), I thought I’d share some of my personal highlights. We had a real f*cking Delorean! From the earliest days of planning Jon had said what he really, really wants more than anything was a Delorean. This was looking pretty unlikely a few weeks before the event when I mentioned this to my good friend @b33rdy who nonchalantly informed me “I know someone with a Delorean”. A few back and forth messages later and the totally cool and accommodating James was hopping on a ferry from the Isle of Wight in his DMC Delorean ready to let us hackers geek out and take selfies with his pride and joy. We had a great turnout and there was a real fun and relaxed atmosphere all day. Everyone really embraced the concept and were supportive and excited for each other’s ridiculous project ideas. 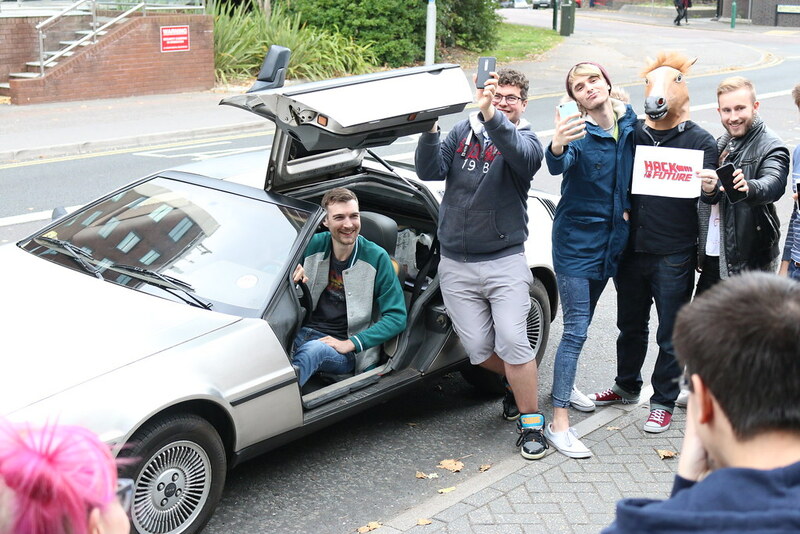 Even local journo Caitlin Marsh was taken by surprise expecting it to be a challenge to convince people to head outside for a photo for the Daily Echo, cue 40+ hackers gleefully swamping the Delorean again making a good shot somewhat tricky. She made a good effort though and it was great to get some coverage of the event. The spirit of the event was captured well in both Jon’s photos and Adam’s photos on flickr. Something I’m always worried about during a hackday is whether or not people will come up with anything good. Fortunately, I’m always wrong to be worried and Hack to the Future was no exception. With around 20 different projects worked on throughout the day and 15 of those presented during the show n tell at the end the quality of the projects was astounding. Particularly when the event was just 8 hours and a not insignificant proportion of that was spent ogling an old car and playing with pizza rehydrators (courtesy of food sponsors Etch). Leap motion controlled HTML5 video player that lets you scrub through video with a left/right gesture but also switch between BTTF and BTTF2 which he demonstrated are perfectly synchronised! App idea to get rid of stuff and eliminate the friction of postage based services. Replicates the excitement of last 5 minutes of an Ebay auction by offering instant purchase and showing how many watchers might scoop your prize from under your nose. Price drops every day but the more watchers there are the higher likelihood someone else will snap up the deal. Sale locally collection only to eliminate postage. 140 character, 1 picture limit to keep things snappy. Will be sharing link to download proof of concept soon. Reverse engineered iPlayer calls and created iPlayer for AppleTV. Included features for browsing categories, search, playing video, scrubbing. Totally unofficial, unauthorised and an exercise in “can it be done”. Available on github. Made a “time to next weather change” app for Pebble. Then made a Chromecast app that will present a 2 frames per minute image from a webcam. Recreated USA today paper as a WordPress website. Included Twitter feed and personalisation. 3D driving game made in Unity where when you drive the Delorean at 88mph = flame trail. The further intention to expand into a Tron like game. Web app making use of wit.ai and a Youtube library to recreate the living room scene in BTTF2 allowing the user to announce their selection of multiple TV channels which will be dutifully presented on screen. And the Weather Channel. HTML/JS app that allows user to enter a date and it will retrieve the #1 chart topper from that date. Dodgy PowerPoint and dodgy logos but the solution to the time travellers dilemma of when to go to. A Trip Advisor clone for Time Lords built using Firebase for persisting data allows users to leave reviews of dates and rate them out of 5. Particular impressive as this was cobbled together in the final 2 hours of the event and Dan (me) did absolutely nothing to contribute short of the worlds worst PowerPoint presentation. Created a LittleBits tweet powered light display using IFTTT to reach 88 tweets per hour. Also created a LittleBits button controller. HTML/Angular/PHP project that uses Twitter API to analyse a users tweets and predict a future tweet based on usage of previous words. Built an AdaFruit Neopixels Flux capacitor for his Telepresent robot. Obviously. Dual netflix VR experience with audio channels abused to send audio from each screen to separate ears. Answered the age old question of “What would the BTTF theme sound like if played on a floppy disk drive?”. The biggest highlight for me was that the overwhelming success of Hack to the Future can be accredited to an amazing collaboration of people and agencies who are willing to invest time and money into enabling such an event to happen. Jon and Adam both work for different agencies, Base who provided the prizes and Etch who fed everyone, whilst we at Moov2 contributed the drinks and 3 Sided Cube contributed their amazing venue and team to help out. All could be considered competitors in the sprawling digital world in which we operate, but all came together to deliver an amazing event for anyone who wanted to attend. Credit absolutely due to everyone involved. They don’t get much reward for the vast amounts of time and money that was poured into the event other than a small bit of recognition and a warm fuzzy feeling. Hopefully they’ll all agree though, totally worth it!